1. Ferenc Farkas: Old Hungarian Dances Intrada 1'58"
2. Ferenc Farkas: Old Hungarian Dances Lassú 2'15"
3. Ferenc Farkas: Old Hungarian Dances Lapockás 1'47"
4. Ferenc Farkas: Old Hungarian Dances Ugrós 1'33"
(from: Finale ActIII. of The Magic Flute; arr. : Reményi Attila) 3'48"
(from: The Ruins of Athen; arr. : Rajnai Csaba) 2'06"
8. Frederic Chopin: Mazurka in C-major Op. 67. No. 3. 9. Franz Schubert: Soldiers' March Op. 51. No. 1. (from: Pictures at an exhibition; arr. : Géza Fűke and Paul Smim) 2'18"
(from: Pictures at an exhibition; arr. : Fűke Géza) 1'15"
(from: Carmen; arr. 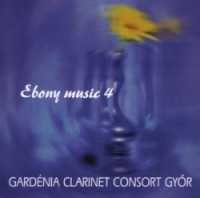 : Géza Fűke) 1'57"
(from: Carmen; arr. : Géza Fűke) 3'59"
(from: Divertimento No. 1. Op. 120.; arr. : András Szabó) 2'16"
(from: Divertimento No. 1. Op. 120.; arr. : Csaba Rajnai) 2'12"
(from West Side Story; arr. : Géza Fűke) 4'17"
20. Jacob Gade: Jalousie 2'18"
23. Ittzés Tamás: Ebony Rag 2'51"